﻿ Alex Ferguson: "Nani has never been in Cristiano Ronaldo's shadow"
08.08.2011 » Alex Ferguson: "Nani has never been in Cristiano Ronaldo's shadow"
Manchester United coach, Sir Alex Ferguson, just won the Community Shield against Manchester City this Sunday and took the opportunity to praise the Portuguese winger Nani, by letting everyone know that he is not living in Cristiano Ronaldo's shadow. Nani scored 2 goals in the 3-2 win over the Citizens and seems to be assuming a similar role as Ronaldo had when he played for the Red Devils. Manchester United defeated City in the Community Shield this Sunday and Sir Alex Ferguson had no problems in giving credits to the MVP of the game, Nani. The Scottish legendary coach defends the idea that Nani is following his own path and should not be seen as a second-line Cristiano Ronaldo. Sir Alex Ferguson was delighted with Nani's performance and assures the Portuguese will be a starter this next season, even though he was benched in the UEFA Champions League final against Barcelona, in last year's campaign. 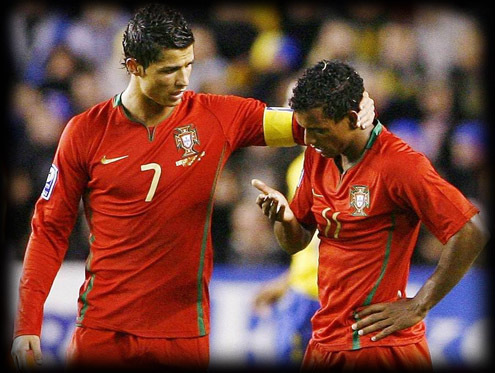 It's almost inevitable that comparisons are made between Nani and Cristiano Ronaldo. Both Portuguese players arrived to Manchester United at an early age, and both had an unquestionable talent, as well as they come from the same "cantera" from Sporting Lisbon. CR7 and Nani were also accused of bringing no end-product in their first years in the English Premier League, but under Sir Alex Ferguson orders, they both developped into World-class players and a lot more aware of the need to play unselfishly. Sir Alex Ferguson: "He is only in Cristiano Ronaldo's shadow because he is Portuguese. That's the only link I can see between both. He was never in Ronaldo's shadow in my mind." said Manchester United boss. "He has always shown to have a great potential, but some players take a bit longer to mature than others. Cristiano Ronaldo was an exception. He truly was an incredible footballer and he matured instantly from the time he joined Manchester United at the age of 18, until he left us for Real Madrid with 24 years old." Whether or not Nani manages to live up for fans expectations and step up as the main key player for Manchester United this season, just like Cristiano Ronaldo did around his 3th year at the club, Sir Alex Ferguson is confident that Nani will beat the internal competition for a spot in the starting eleven: "Nani had a really great season with us last year. But, unfortunately, Antonio Valencia got back from an injury at a late point of the season and we needed his freshness and speed to give a boost to the squad in the late stages. ", said Alex Ferguson attempting to justificate why Nani got benched against Barcelona in the UEFA Champions League final. However, he then added: "You've all seen Nani's form in this pre-season campaign and again yesterday, against Manchester City. He will start the season in the line-up." Real Madrid already focused in the clash against Barcelona, in the next weekend, after having ended the pre-season tour in China. Next Sunday, Cristiano Ronaldo and his team mates will play the first leg of the Spanish Supercup against Barcelona, in the Santiago Bernabeu. This will be the first of two games against Barça, and it will be played next Sunday, in the 14th of August. Cristiano Ronaldo is expected to be a started and you can watch the match Real Madrid vs Barcelona online live streams inside the Live Games Streams section. Countdown clock for the game is shown in the top right corner of this site.